There’s actually no petition. The UPND is suing on the basis of the Bill of Rights which guarantees the right to be heard. It is a case that is going nowhere and assuming that the UPND got a declaration that their right to be heard was breached, so what? The right to be heard alone will not force the ConCourt to suddenly hear the petition. But UPND people are quite interesting! Ba Munshya, Munshya, ala awe mwandi, that’ s why with such people like you whose judgment is always biased, this nation shall not get anywhere. Sometimes ba Munshya, it’s vital and advisable to shut up your beak than to pass on comments that lack substance. There are people whose degree of reasoning surpasses your biased if not shallow reasoning. If this nation is characterized by brainwashed people like you, then democratically, this country won’ t get anywhere. You know the wrongs which were done during the process for the petitioners to raise the argument yet you are in the forefront of supporting a corrupt and thuggery system of vultures. You MUST be sick in the head. The PF administration of Edgar C. Lungu is moving at fast speed to destroy the whole normal process of democracy and democratic norms in Zambia and that is a great danger to this nation. Please, be reasonable and begin to see things on broader base. The writer of this Article is mistaken. The Petitioners know very well that they will not get Justice in Lungu’s compromised Courts. All the Petitioners want is for the High Court to Rule that it has No powers to hear the Petitioners and has no jurisdiction over the Bill of Rights. Now that the Petitioners have exhausted domestic remedies and the 6 months is up they can take their Petition to International Courts. Why is the High Court reluctant to give its verdict on this Petition? The Lungu controlled Courts know the implications of such a Judgment. Now that the 6 months has lapsed since the Petition was filed the Petitioners are legally entitled to take their Petition to ICC and ICJ. These Courts have powers to declare HH the Winner of the 2016 Presidential Elections. Once such a Judgment is made we will need the Ecowas formular to enforce the transfer of Power from illegitimate Lungu to HH. Meantime Lungu will be indicted by ICC and join fellow criminals like Lorrent Gbagbo of Ivory Coast in jail in the Hague. The ICC Fugitive , Omar Al Bashir of Sudan will not save Lungu even if Lungu unilaterally pulls Zambia out of the ICC. Its too little too late from Bashir. Just like Sudan Zambia will become a Pariah State and illegitimate Lungu can forget about Financial Assistance from the West and the likes of IMF,World Bank and other International Financial Institutions. Start preparing for the next election. When is the inauguration of your HH going to take place? SO ACCORDING TO THE WRITER HH SHOULD HAVE INSTEAD BEHAVED LIKE A CONGOLESE BY PICKING UP ARMS. WHAT KIND OF STUPIDITY IS THIS. FIMO KUNFWAKO NENSONI. LET THIS CASE FAIL IN COURT IF IT HAS TO, NOT THROUGH STUPID COMMENTS LIKE YOURS. SO ACCORDING TO THIS WRITER HH AND TEAM SHOULD HAVE BEHAVED LIKE A CONGOLESE BY PICKING UP ARMS, JUST WHAT KIND OF STUPIDITY IS THIS. LET THIS CASE FAIL IN COURT IF IT SHOULD NOT THROUGH STUPID COMMENTS LIKE YOURS. 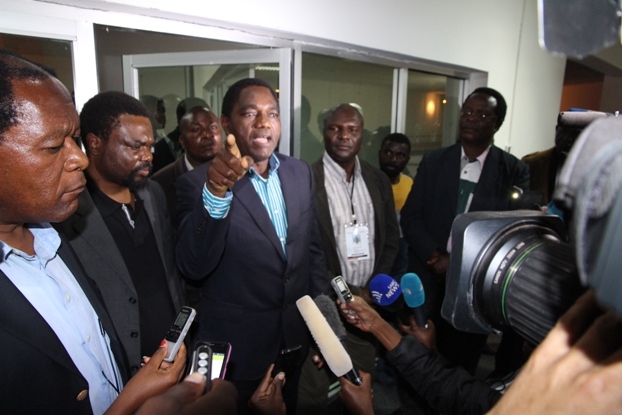 Has UPND (HH and GBM) taken the matter to ICJ or ICC? Can they really get justice done there? Is this the reason Lungu advocating the withdrawal from ICC? Now I see why HE wants to pull out of ICC. Remember the law regarding water in Physics?… “WATER FINDS IT’S OWN LEVEL”.. So this situation will naturally find the level. Uli chikopo iwe.Chalo nshi waumfwapo ichaya ku ICC to be installed to power?ICC has no power to do that in any country. It is UPDN and it supporters whose heads are not functioning properly. There is no petition and there will never be any for the 2016 elections. This ICC issue is just political immaturity and lack of knowledge. If We Claim To Be Sons & Daughters Of The Most High Its Better To Sit Together & Talk What Went Wrong.